Earlier this year, astronomers celebrated the discovery of one of the youngest galaxies ever seen, but what was almost as astonishing was the way in which the far-off galaxy was found. 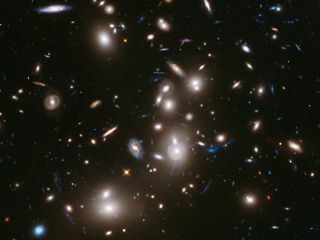 The discovery was made using the Hubble Space Telescope's Frontier Fields project, which revealed several hundred galaxies in the Abell 2744 cluster about 3.5 billion light-years from Earth. You can see a video on the Hubble Frontier Fields effort here. Ever since Albert Einstein formulated his general theory of relativity, astronomers have known that gravity warps space-time. As a result of this warping, when light passes near a massive object, like a star, the light's path will curve. When pointing the Hubble Space Telescope at the massive Abell 2744 cluster of galaxies, scientists took advantage of this principle. When Hubble peered through space at Abell, it showed images of galaxies from behind the cluster. The light from those distant objects had been bent and focused by the gravitational force exerted by the cluster; the astronomers had, in effect, used a group of galaxies as a huge lens. The background galaxies — 3,000 in all — appeared 10 to 20 times as large as they would have otherwise. This observation was part of a larger Frontier Fields project using Hubble for extreme deep-space observing. Astronomers plan to repeat the gravitational-lensing observations with five more galaxy clusters over three years. Frontier Fields will combine the Hubble images with those taken with the Spitzer Infrared and Chandra X-ray telescopes to learn about the early stages of the universe. Follow Raphael Rosen on Twitter @raphaelrosen22. Follow us @Spacedotcom, Facebook and Google+. Original article on Space.com.